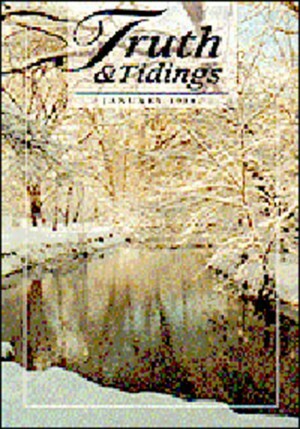 In the May/June 1994 issue of Wholesome Words for Spiritual Guidance, an assembly magazine from Australia and New Zealand, there is an article entitled, “The Things We Sing”, in which the author writes, “During a recent overseas visit, I once spoke about the need for Christians to present the Savior’s uniqueness in every possible way and stressed too the importance of singing hymns and choruses with a clear Christian content, words which should leave newcomers in no doubt as to our attachment to Christ as Savior, and of His dying love for a sinful world. I recalled how I once opened a song book, purely at random, and found a large proportion of the compositions made no reference to our Lord Jesus Christ in any shape or form. They were mostly taken from the O.T. with words of praise to ‘God’ or ‘the Lord’, and in such terms that, as I remarked, any orthodox Jew could have sung them and felt completely at home. Following these remarks, two local brothers went even further and said, not only could Jews sing some of our latest choruses, Buddhists and Hindus could do likewise, in that they could easily refer to their heathen deities as ‘God’ and ‘Lord’ (e.g. Lord Buddha) and extol their power, wisdom and mercy.” This gave added. weight to the point I was making: the danger of singing words which fail to point sinners to Christ and to Him alone. And herein lies the dilemma, the crux of this issue. How can “Christian” music be Christian, if there are few if any direct references to the Person and Work of Christ? If there are any connections to Him and to Scripture, they are often tangential, skewed or hidden at best. Paul was plain, preaching about his Savior and the monumental miracle that was Calvary and the resurrection, that “this thing was not done in a comer.” Unfortunately, much of the modem “Christian” music is around the corner. Perhaps the best way to define what Christian music really is, is to study some that has lasted for years and years. The author would suggest the interested reader to carefully study the lines of the following hymns: “It is Well with my Soul” (verse 3), “How Great Thou Art” (v 2), “When I Survey the Wondrous Cross” (v 4), “At Calvary” (v 4), “And Can It Be” (v 3), “Man of Sorrows” (v 2), “Brethren, Let us join to Bless” (v 5), “Down From the Glory” (v 1 & 2), “No Gospel Like This Feast” (v 2), “Majestic Sweetness Sits Enthroned”, “What a Friend we have in Jesus”, “My Redeemer”, and even “Hark the Herald Angels Sing”. It will become readily apparent that these lines are deep, rich, full of devotion to the Savior, Scripturally accurate, heavenward in their thinking and born from the souls of men and women who knew the Bible and their Lord. It should come as no surprise then that the most poplar Christian music of the past ten years is the rerecording of the good old hymns. One of the newest CD’s, which should sell by the thousands, is simply called “HYMN”, sung by Steven Curtis Chapman and Twila Paris, two of the best of the new artists. Acappella. hymns are incredibly popular. Many artists are including 2 or 3 hymns on every new album. Some have done several albums, just of hymn favorites. Even though the author personally admires these grand old songs of the faith more and more, this article is not to be construed as this is all a young Christian must listen to. One will not go wrong running the old hymns through one’s soul, but there are good new hymns as well. However, one must be very particular and very disceming. Some examples of good song titles written and recorded in recent years are as follows: “Saving Grace” and “Thank You” by Ray Boltz, “The Lord is my Banner and Shield” by Larnelle Harris, “We Trust in the Name of the Lord our God” and “That’s Where His Mercy Begins” by Steve Green, “He Never Changes” by 4 HIM, “The One Who Loves me Most” by Glad, “Lamb of God” by Twila Paris, “Will You Come to Jesus?” by Pam Thum, “The Cross that Bears His Name” by Cheri Keaggy, “Please Him” by Keith Lancaster, “No Less Than Me” by the Blackwoods, “Train up Your Children” and “Rise Again” by Dallas Holm, “There’s Still Power in the Blood of the Lamb” by Heirloom, “The Old Rugged Cross Made the Difference” by Bill Gaither, and most of the songs written and sung by Michael Card including “El Shaddai” and, “Joy in the Journey”. This is not a specific commendation of any particular artist, but will serve to prove the point that many of the new song titles speak much to the spiritual quality and character of those who sing them. You often CAN tell a record by its cover! The artists chosen for the above illustration are ones whose lives, reputations, testimonies and music have been consistent for the Lord, but are not taken as blanket endorsements. Here then, are some suggested guidelines for choosing the right kinds of Christian music, and tests of the music you are currently listening to. But from a purely, common-sense standpoint, all music should be placed up against the Word of God, with sincere prayer asking the Lord for guidance in this matter. For after all, “It DOES matter to Him about you” (1 Pet 5:7b, literal translation). 1. Choose The Artist: The person(s) singing and\or writing the songs generally make the difference. Spiritual songs come from and are sung by spiritual people. Some of the criteria that can be used are Christian reputation, character, spirituality and testimony, but if that is not readily known, it would be better not to buy until it is known. Another guideline is appearance. Does the artist or artists look like Christians? There still are some singers that take literally God’s Word which says, “Abstain from all Appearance of evil.” While it is not a hard and fast fact, it still is a general one: if the artist looks worldly, there is excellent cause to believe that the music will sound and be the same. 2. Be a Wise Steward of The Lord’s Money: It is amazing how much money is spent on music. We have heard repeatedly that ALL of our money is the Lord’s, not just what we set aside to give to Him or to His workers. The author has “taken a chance” on buying tapes that as soon as listened to, were discarded. This is a waste of the Lord’s money. An excellent way to be a good steward is the use of in-store demos. Many Christian bookstores now have demonstration tapes that can be listened to privately in the store. This will save misspending money that could be better used. 3. The Generation-Gap Test: Try your Christian music out on the generation removed from you, and see if they like it. Right now, many are saying, “That’s not fair! I know already that my parents can’t stand this music!” But that is not the generation to test it on. Play it for your nieces, your nephews. Play it in your home, for the children you teach in Sunday School. How do they react? Do they understand it, or is it a foreign language to them? Could they be saved through it? Would it be a stumbling block to a very young believer? If it fails this test, then you should not be listening to it. This means that if the generation before and after you do not like your music, then the only generation that does is yours. And that is dangerous, for that is just how the world compartmentalizes its music. The old hymns have stood the test of time, generation after generation. If your music fails this test, get rid of it. 4. How Much Scripture is in the Songs You Listen to? In 1 Corinthians 14:15 Paul states, “I will sing with the Spirit, and I will sing with the understanding also.” This is in relation to the assembly and is used in the context of proving to an outsider, by the wisdom and clarity of an assembly meeting, that “God is truly there.” There is no better way to prove this than to sing and pray in a scriptural manner! So then, could your Christian music be used to prove to an outsider the centrality of the Lord Jesus Christ? His Deity, Person and work? His redemptive and forgiving love and power? The reasons why we love to gather to Him? Make very sure that your Christian music is full of scriptural and spiritual understanding. But this truth is vitally important for yourself too. Psalm 42:8 records that in nights when he lay awake and could not sleep, the Lord sent him “His song”. Could your music be classified in this way? If the words and tunes came to you in the middle of a sleepless night, would they teach you more about your Saviour? Would the Lord Jesus be willing to send to you at night as His song the music to which you listen? 5. Do your songs help you to know your Lord and Savior better? All Christian music should direct the heart and soul to Him; after all, we have borrowed His name to identify this music. And Godly music can be used to reveal Him to us, as well. The most graphic description of the Lord’s suffering in all of Scripture is in Isaiah 53. Is it a coincidence that the first word of the next chapter is “Sing”? The sufferings of Christ on our behalf are enough to repeatedly cause the redeemed to sing; this will be the theme of Heaven. What did Paul and Silas do after they had been severely beaten and imprisoned? They sang praises to their God, and preached by their singing. The song God gave to them at midnight brought the opportunity to see the light of the Gospel shine into dark hearts. The Psalmist, in deep sorrow and affliction, prefiguring the agony of the Savior, reminded his heart that “The Lord will command His loving kindness in the daytime, and in the night His song shall be with me” (42:8). But he also said in Psalm 100, “Make a joyful noise unto the Lord … come before His Presence with singing.” We must never forget that the songs we listen to, sing, learn and play for others, are being tested by the austere light of His Presence. 6. What is the “Comfort Zone” of Your Christian Music? a simple test of the Christian music that you listen to is to play it for those that you respect in Christ. Play it for your grandparents. Play it for your Sunday School teacher. Play it for the elders of your assembly Then play it for your unsaved friends. In which situation did you feel the most uncomfortable? As your unsaved friend listened, did he hear a Gospel message? Did his response encourage you to tell him how you were saved. If you felt uncomfortable having godly, spiritual Christians listening to that same music, then don’t listen to it yourself. It will never help you to become as godly as your role models. Likewise, judge how the listeners react to it. If your unsaved friends liked it and found no problems with it, it probably had very little of the Spirit of God in it. However, if your godly elders did not appreciate it, and told you so, the reason could very well be that they felt the need to step in and “watch out for your soul” (Heb 13:17). 7. What Influence Does or Would Your Christian Music Have on Your Assembly? It has been said that what I listen to in private should not really matter. Yet, the type of music you listen to, especially if it is a part of your daily life, serves to shape the kind of Christian you are. So what have you been bringing to the assembly? Could the songs you have been listening to be quoted in a Gospel meeting? In a ministry meeting? At a Conference? To illustrate a point in a Bible Reading? If your answers are “No” in relation to your songs and your assembly, why should they be part of your “private” life as an assembly Christian? The author is deeply exercised about the spiritual maturity of assembly young people, because very soon, if the Lord tarries, they will be responsible saints in the local assemblies. What deep and stabilizing preparations have they made? Considering all the time spent listening to music, this is one aspect of our lives that should truly be used for the glory of God and the deepening of our Spiritual lives. It should never be used just as entertainment, nor as just a substitute for secular music. Music should also never be a substitute for the reading and study of His Word and the spending of time in prayer and meditation. But one of the main things reviewed at the Judgement Seat of Christ is what we have built into the assembly the Lord has gathered us to, (See 1 Corinthians 3:10-23). Good Christian music can be precious. But much of it today is wood, hay and stubble. This can only be detrimental to the church.